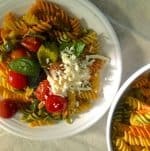 Well then, here is my post on Neer Mor, with the recipe card below. Neer Mor or as it is variously spelt – Neer More/ Neer Moru is the South Indian buttermilk, mildly spiced and with herbs. It is quite similar to chaas. 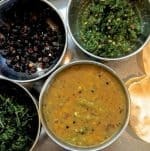 As is usual in Indian cuisines, each region has its own version – some with cumin (jeera powder) added to the buttermilk, some with hing (asafoetida), some without. 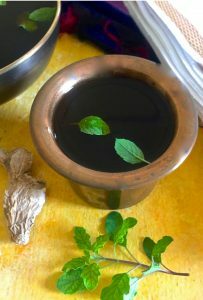 The recipe below is for the version of Neer Mor that my mother is used to prepare for the festival of Sri Rama Navami, ie the Tamilian preparation of the drink. 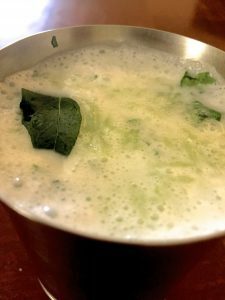 I have added one more dimension to the drink – my sambandhi Ms Uma Maheshwari, whom I am visiting at Chennai this week, suggested that I add grated / thinly minced cucumber to the buttermilk, and this caught my imagination. It is so hot nowadays and we have a whole summer to cope with: the combination of buttermilk and cucumber sound heavenly. 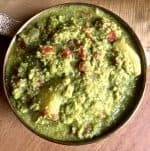 Sri Rama Navami this year is tomorrow, the 25th March 2018, and Neer Mor, Panakam and a simple salad called Vada paruppu are standard preparations in most South Indian households, as part of the feast and the neivedyam offered to the deity, on that day, ie on the birth day of Sri Rama, the 7th avatar of the God Vishnu, as per Hindu Mythology. All these items are cooling and refreshing and suit the sunny days of end March or early to mid April when the festival usually occurs. 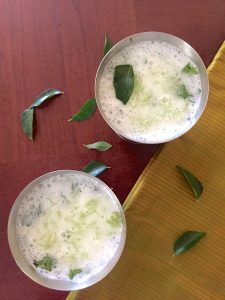 Many of us however, prepare Neer Mor and Panakam throughout summer – they are easy, simple, delicious and just hit the spot when you are thirsty. The preparation will take you only a few minutes, its just a matter of churning the curd with water to make buttermilk and adding all the ingredients, finely chopped/ minced and finishing off with a tempering of mustard seeds. 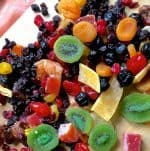 Try making this today, you will love this Summer Cooler! 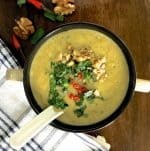 You may like to try this recipe on this blog for Panakam, the jaggery and dry ginger, cardamom drink too! 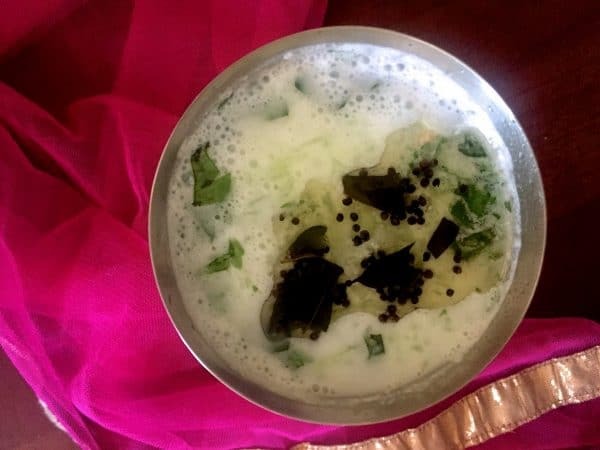 Neer Mor -Refreshing summer cooler of Buttermilk made from yogurt and water, spiced with green chilli and flavoured with herbs, ginger and cucumber and tempered with mustard seeds and curry leaves. Chill and serve on a hot summers day. i. Slice the green chilies into small rounds. ii. Mince the ginger into tiny pieces or crush the ginger and then slice. iii. Tear the curry leaves into shreds, slice the coriander leaves into small bits. Reserver a little of the curry leaves for tempering. I always shred the curry leaves as otherwise the nutritious benefits are lost as we tend to pick them out and discard them. iv. Peel and grate or mince the cucumber into very small pieces (if using). Grating is best. Churn the curd and water to a thin watery buttermilk, with the 'math' or wooden churner, or in a mixie. 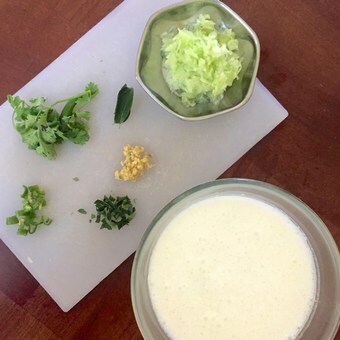 As liquid tends to slosh and spill out of the mixie, first add ½ cup of water to the curd, churn in the mixie, remove to a bowl and then add the rest of the water. You may add upto 3 cups of water for 1 cup of curd - I wanted a thin but not watery consistency so I added 2.5 cups to 1 cup of thick curd. Add salt to taste, stir till the salt dissolves and then add all the ingredients listed above under 'To make the Neer Mor' except for the cucumber. Pour the tempering (see instructions below) onto the neer mor, and garnish with the cucumber. Serve chilled. Heat the oil. Use a mildly flavoured oil such as sunflower oil and not strong oils such as sesame oil/ gingelly oil or coconut oil which may overpower the taste of the buttermilk and the other ingredients. Add the mustard seeds, and once they sputter, add the shredded curry leaves. Pour the tempering onto the prepared butter milk. Olive oil may not suit as it would give a flavour one does not expect from this butter milk drink, and may also again overpower the taste. Can feel the taste. Perfect drink for this hot weather. Thanks for sharing.